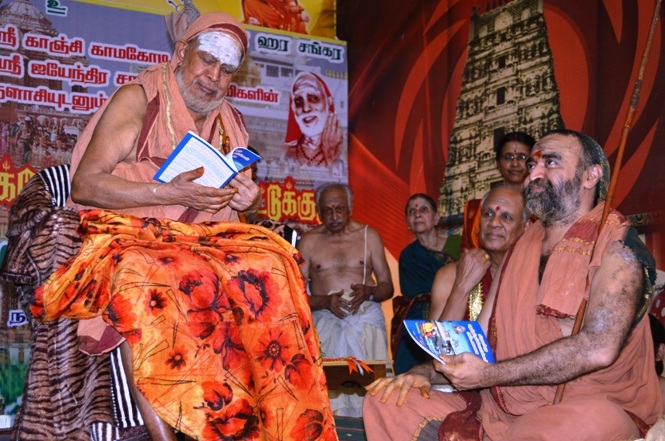 The fourth annual meet of the Tirukkovil Vazhipattu Kuzhu(Temple Worship Committee) was held at Shri Kanchi Kamakoti Peetam, Kanchipuram in the benign presence of Their Holinesses Pujyasri Jayendra Saraswathi Shankaracharya Swamiji and Pujyasri Shankara Vijayendra Saraswathi Shankaracharya Swamiji. The programme commenced with recitation of Shrimatam Swastivachanam, followed by Prayer. Shri Kannan - Coordinator of the Kanchi District Tirukkovil Vazhipattu Kuzhu presented the welcome address. 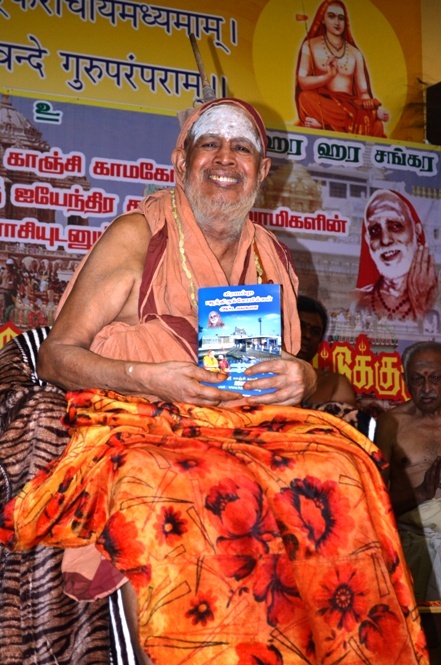 His Holiness released a book titled "Kanchipuram Vattam Tirukkovilgal Attavanai" (Tamil ) - A listing of temples in the Kanchipuram District . Earlier, similar listing of temples in other Districts have been brought out by the committee. 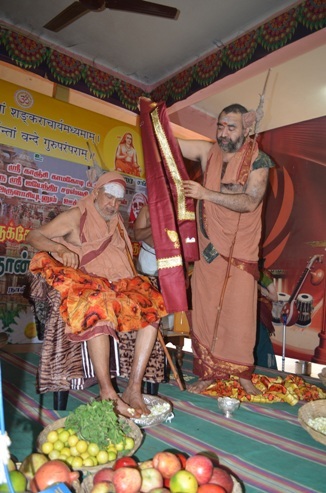 Their Holinesses blessed the gathering with Anugraha Bhashanam, highlighting the importance of our temples. 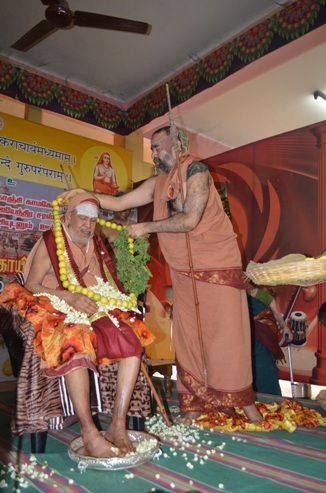 His Holiness Pujyashri Shankara Vijayendra Saraswathi Shankaracharya Swamiji performed Padapuja and Deeparadhana to His Holiness Pujyashri Jayendra Saraswathi Shankaracharya Swamiji. Traditional Village Arts and Dance were performed by the participants. 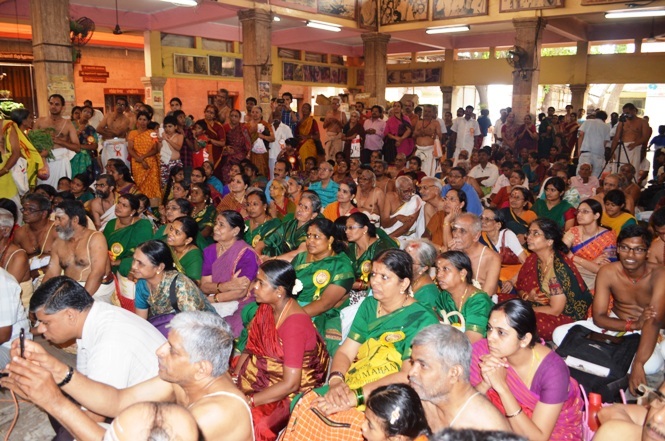 A large number of devotees from different villages in the Kanchi and nearby districts took part in the meet. 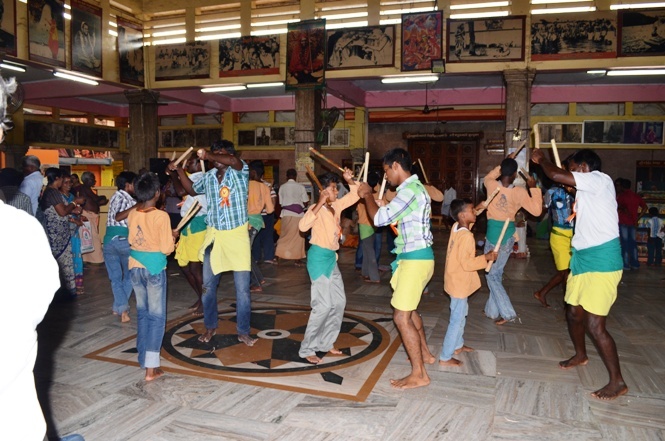 Earlier, they had darshan of the Sri Kamakshi Ambal temple, followed by Annadaana Prasadam at Shrimatam's annadaana Hall. 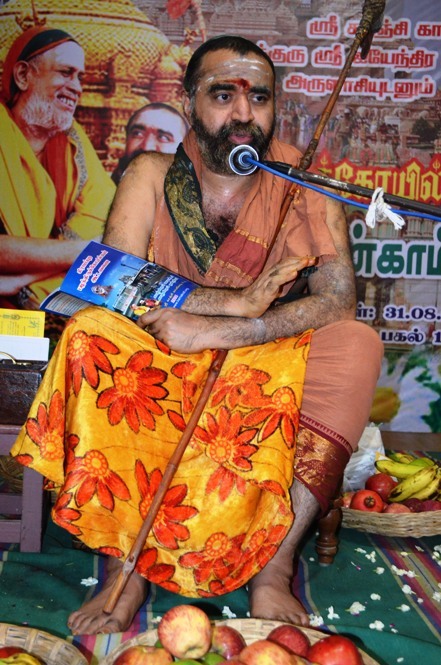 With the blowing of conches and other musical instruments used in temple worship, the participants arrived at Shrimatam in a ceremonial procession through the Raja Veedhi, from Kamakshi Amman temple. 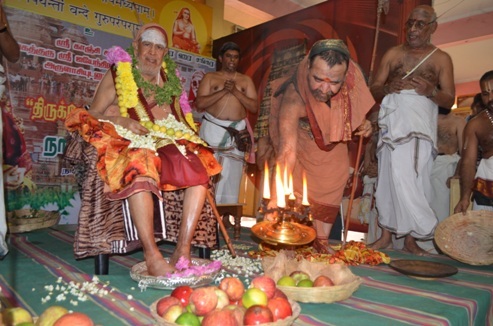 The Tirukkoil Vazhipattu Kuzhu has been started with the benign blessings of Their Holinesses Pujyasri Shankaracharya Swamijis of Shri Kanchi Kamakoti Peetham with the objective of enabling the conduct of Nitya Puja in village temples, to involve the villagers to participate in the worship and upkeep of their temples, distribution of materials required for nitya pooja, distribution of religious books & cassettes, organize bhajans and encouraging age-old traditions of chanting Tirumurai, Divyaprabandham, Tiruppugazh, and also to conduct other activities like quiz, yoga competition, shloka chanting etc in the temple premises to involve children and youth of the villages. The programme concluded with recital of 'Maitreem Bhajata'. Under the committee's coordination, teams from Chennai have been formed and are visiting villages present in the Kanchipuram Dist and Tiruvallur Dist in the weekends for the past two years. The Acharyas also visited a chain of temples in the Uttiramerur Taluka in Kanchipuram Dist. to encourage the visiting teams and also to stress importance of daily worship amongst the villagers . A stream of activities are being carried out in the dist. under the leadership and coordination of Shri Vishwanathan of Pammal Satsangam (944380697). The Kuzhu has a bus to enable to transport volunteers from the city to the villages and also to carry pooja materials.